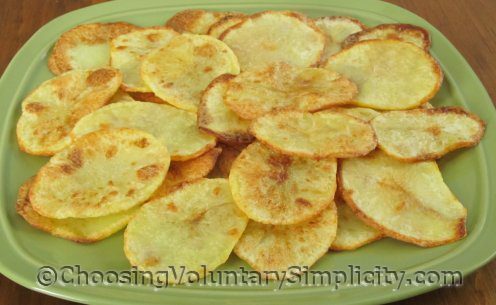 Reader question… “I wonder if you ever make potato chips and if you do would you share how you do it. I tried several baked potato chip recipes but the chips I made weren’t very crispy and didn’t really look or taste like a real potato chip. My kids miss having chips at celebrations and I would be forever grateful if you could help me with this.” –Schuyler T.
The secret to making crispy potato chips in the oven is that the potatoes MUST be cut in very, very thin slices. This is possible but very difficult to do with a knife… but not difficult at all to do with a mandoline! Even an inexpensive mandoline like the one I have makes it very, very easy to cut almost paper-thin slices… I actually use the second to thinnest setting on my mandoline when I make baked potato chips. You also need a moderate to very hot oven temperature. In my oven a setting of 425°F seems to be about right, although my oven runs hot, so you might need a slightly higher setting. Oven baked potato chips need to be watched because they can… and WILL… burn in an instant, so check on them every few minutes during the baking time. Most recipes specify that the potatoes should be cut in very thin slices, or about 1/8 of an inch thick, but thinner mandoline-cut slices will make crispier chips. I have found that lining the baking sheet with aluminum foil and lightly coating the foil with olive oil will help keep the chips from sticking. I bake the chips until the top sides of the potatoes are nicely browned (this usually takes about fifteen minutes) and then turn the slices over and bake for another ten to fifteen minutes. If the potatoes were sliced thinly enough, the baked chips will be crisp… although baked potato chips do not hold that crispness and are best eaten freshly baked. Baked potato chips are delicious, but they’re in a category all their own, and they don’t look or taste like “real”… deep fried… potato chips. I’ll share how I make those in another post. I remember after I was sick when I was about 12 the first thing I ate were some chips cut like that made by my dad (who never cooked). They tasted so good. I agree… a mandoline makes all the difference. With one chips are easy. A mandoline is also great for so many other things. I wonder how I ever managed without it. I love this blog!!!!!! I made some of these last night and boy were they good. I didn’t have to worry about them getting cold and possibly not crisp because my boys ate them right off the baking sheet as fast as I brought one out of the oven. I’ll be interested to read how you make the fried chips too. Thanks for sharing. This is something I will have to try. I have tried making these cutting slices with a knife and they weren’t crisp but my mom has a mandolin. I will borrow it this weekend and have another go. Ever since I saw this picture I’ve had a craving for making these. Nice idea and it sounds easy enough for a new cook like me. I’m 19 and in my 1st apartment and just learning to cook simple things. Your recipes and explanations are very helpful to me. I especially appreciate the way you do step by step if something is hard to understand. You don’t know it (well I guess you do now) but you’re making me a better cook. My thanx. Instead of using aluminium foil, why not invest in a silicone baking mat which you can re-use over and over again at no extra cost. Dani, I could use a silicone baking mat, but like many people I have concerns about how safe THEY are. Although the FDA has approved them for food use, they have not been tested at the high temperatures used in baking. Many people feel that the fillers in these silicone products or oils or even the silicone may leach out into the food products during high temperatures or if the silicone products become scratched or worn. I don’t use aluminum foil very often, but in the rare instances where I do, I don’t worry about it because there is no definite proof yet that the warnings are valid. I would not, however, use aluminum foil on a regular basis because like you I do have concerns about these products that are “out there” but that may not be safe.